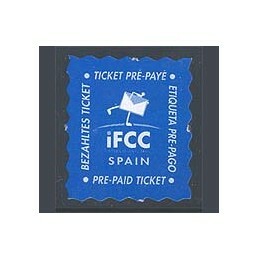 IFCC (1999) - Pre-paid ticket, type 2. Used stamp - postage paid mark. 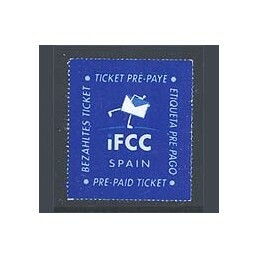 IFCC (1999) - Pre-paid ticket, type 2. Tourist postcard mailed in Spain, remailed - postage paid mark from GERMANY. Various postcards in stock, the image is only a example. IFCC (1999) - Used Pre-paid ticket, type 3. EXPRESS mail. IFCC (1999). Type 4 - Serpentine roulette. Mint pre-paid ticket. IFCC (1999). Type 4 - Serpentine roulette. Used pre-paid ticket. IFCC (1999) - Pre-paid ticket. Type 4 - Serpentine roulette. Tourist postcard mailed in Spain, remailed from Germany. Various postcards in stock, the image is only an example. IFCC (1999) - Pre-paid ticket. Type 4 - Serpentine roulette. Tourist postcard mailed in Spain, remailed from Switzerland. Various postcards in stock, the image is only an example. IFCC (1999) - Pre-paid ticket. Type 5. Mint pre-paid ticket. 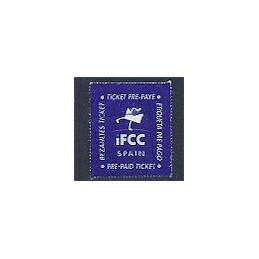 IFCC (1999) - Used Pre-paid ticket. Type 5. IFCC (1999) - Pre-paid ticket. Type 5. Tourist postcard mailed from Spain, franked with IFCC label. No postage paid mark. Varios copies in stock, the image is only an example. IFCC (1999) - Pre-paid ticket. Type 5. Tourist postcard mailed from Spain, franked with IFCC label. BELGIUM postage paid. Various copies in stock, the imagen is only an example. IFCC (1999) - Pre-paid ticket. Type 5. Tourist postcard mailed from Spain, franked with IFCC label. GERMANY postage paid. Various copies in stock, the imagen is only an example. IFCC (1999) - Pre-paid ticket. Type 5. Tourist postcard mailed from Spain, franked with IFCC label. Switzerland postage paid mark. Various postcards in stock, the image is only an example. IFCC (1999) - Pre-paid ticket. Type 5. Tourist postcard mailed from Spain, franked with IFCC label. United Kingdom postage paid mark - 1st class. Various postcards in stock, the image is only an example. 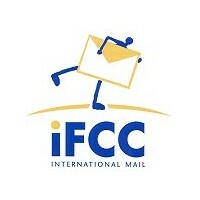 IFCC (1999) - Pre-paid ticket - EXPRESS mail. Type 6 - Serpentine roulette. Used stamp - prepaid ticket. IFCC (1999) - Pre-paid ticket. Type 6 - Serpentine roulette. Postcard remailed from Switzerland (P.P. CH-8058 Zürich Priority). VARIABLE - Special edition Remailing in Spain. The tourist postcards Size: 21 x 21 cm. - 46 pages - Color - Spanish & English edition. (IMPORTANT. The price includes the shipping by economy mail as a printed matter each three months, along with other publications. For other shipping options, please contact us).